I've been focused purely on progressing my upper body lately. Having an injured wrist for most of my time training until recently, I have a very weak base to start from, but hopefully that means I'll have the early stage gains quickly giving me the feeling of progress, and whilst my knee recovers it gives me more of an upper body focus to work with. I've been working on my muscle ups, aiming to have a couple of sessions a week where I'm practicing them on a pull-up bar in a local park. I'm finally able to perform muscle ups with both arms together instead of always having to lock out one arm first and then struggle to get the other up above the bar. The main way this has happened has been through technique, attempting to get up to the top of the bar "gymnast style" which is almost purely done through swinging, pushing out the chest and kicking high, so the swing takes you to the top of the bar and much less strength is required. Right now I'm completely unable to do this! The motion of kicking up with both of my legs seems unnatural to me so I always perform the motion of attempting a standard muscle up, but it has taught me to utilise the pushing out my chest as part of the initial swing and allows me to finally perform clean muscle ups, so I'm pleased with that. I've also in the last few weeks been able to do multiple reps in a single set which is much more a test of strength and technique so my training going forward will be performing multiple reps each time. The other area that I'd like to progress in is gaining the ability to hold a handstand. Before last month I could count the number of sessions that I'd attempted handstands on one hand, and having my injured wrist means I'd never had the motivation to try and potentially hurt myself (it's fine for handstand now, even turning on that wrist to get out of the handstand when I go too far over). The main way I've been practicing is by trying to go straight into a free handstand from squat and jumping up into position, hoping to hold position. I've definitely made progress but it's still very rare that I reach the balance point and hold it for even a second, though occasionally I'm there for a good few seconds. I've decided to definitely change strategy and will start working on my frog stands, developing the instinct to counterbalance and regain control primarily using my hands, pushing from my fingertips or my palm, and generally get used to the motion and position of balancing on my hands, and hope the understanding I gain will transfer well into my handstand practice. This is also something I can practice at home in the tiny space that I have which would not permit handstands at all, so that's also reserved for the local park. Other news is that on my first attempt to go up into handstand position whilst holding onto my pushups bars (having taken them outside) ended with me tipping, landing on one of the bars and breaking it; not the best first attempt! Looking back at the topics I've posted about so far I may as well rename it "Matt Injury Blog" at this rate. Unfortunately it hasn't been the best 12 months having had only a couple of weeks injury free (nasty ankle thing, long-lasting wrist injury, broken toes, and nasty knee injury). Also, the only times I'm really free to post is when I'm at home so times that I can actually do parkour and post about that I'll be out training instead so I should make more of an effort to actually talk about my training. Right now my training is mostly on hold to avoid using my legs and hurting my knee, but I'm still out having a few muscle-up sessions trying to even out the strength in my arms: my wrist injury has left a very weak left side so all techniques are biased to one side only worsening the strength difference. I will return to training and posting about it! tl;dr: NHS can be great but you'll be lucky if you do get great care at all times. I'll talk about my physio at some point now that I'm seeing a private physiotherapist, but first I'll sum up my thoughts on the NHS. Note that this is purely anecdotal from my experience and those around me that I've spoken to. Perhaps half of NHS staff are brilliant, maybe even more of them, with good intention, good experience and all round high quality of care. Seeking to solve medical problems through the NHS however, especially those that present themselves after an accident of some kind, is very hit and miss. If you're lucky and you go through A&E with an accident that occured because of some unknown-but-existing problem then it's almost certain that it will be treated as a regular injury without examining further to identify exactly where the problem is, regardless of reason. I injured my wrist some time ago and was told it would "heal up by itself in a few days, maybe a few weeks" and after a few weeks passed I went to see them again and got exactly the same story. It was only after a referral to a private specialist, by my request, that the idea of it not healing by itself was entertained. Now that I've injured my knee (patellar dislocation due to a maltracking knee cap, which happened due to an excessive twisting motion during a mis-stepped landing doing parkour: a running precision (~10ft) to step-through on a low flowerbed) I've encountered similar delays in healing due to the way the NHS have dealt with this. After the initial injury I was unable to move even slightly without extreme pain so was lying on the ground with my leg propped up for over an hour before the ambulance arrived, which was an annoyance but I'm certainly not kidding myself that it's anywhere close to an emergency on the level of heart attacks, shooting, etc. The ambulance took me to hospital, at which point I had to sit and wait, which is fine as of course other patients have as much need as me, but then they made me walk (!) through to see the nurse despite my obvious agony, thankfully after walking a bit one of the more helpful members of staff had spotted this and came across the room to help halfway through my hobble-hop-pain-journey! The nurse was pretty helpful and did many of the movement tests to check that the ligaments were fine but as soon as she saw that they were okay, I was given crutches and sent away having had no x-ray and told to see an orthopaedic/orthopedic doctor at the end of the following week. The notes from that encounter mentioned potential medial mensicus damage, but the orthopedic doctor suspected ligament damage before even touching my knee and didn't check for that using the McMurray test, though was thankfully very insistent on getting an x-ray done that should have been done at the time (the form that the nurse filled in had a box of things to check and do on "all knee injuries" and that included x-ray). I got an MRI and saw the orthopedic doctor for a second session but his suspicion of it being ligament damage and having not read the report of potential cartilage damage meant that was all he looked at, and he sent me away saying that the ligaments were fine and it will heal up by itself with the only pain being due to a couple of bruised bones that he spotted. I had a follow up appointment the following week to see if the radiologist's report of the MRI scan would agree with the diagnosis. I only did this because of having an MRI earlier in the year for my wrist and the helpful private doctor gave me a diagnosis and then explained that after any medical imaging the radiologist also reviews the images and reports potential problems with the scanned body part, so this report acts as a second opinion. My follow up appointment was then very insightful thanks to this, far from the "it'll heal up by itself" story I'd heard the previous week that would have been my end diagnosis and thoughts had I not arranged a second appointment. A deeper look into the MRI revealed that my knee cap (patellar) has a predisposition to dislocate, something apparently more common in women than men thought I wouldn't consider my legs feminine!, due to various things including the groove upon which the kneecap sits being slightly shallower than normal and it being slightly off centre. This second time I saw a much more informed and useful doctor. The first doctor I saw the previous week was very friendly and I'm sure if it was ligament damage he'd have been able to help just fine but due to his focus there didn't pay enough attention elsewhere on the knee so the second doctor, especially armed with the more open minded (I mean not to insult the closed-mindedness of the first glance look the doctor had, but it is was it is) analysis of the MRI, was able to give a much better explanation and diagnosis, as well as potential options, the end goal of which was a referral to physiotherapy. This was great! I'd gone into the second session knowing that were I not to get a satisfactory diagnosis that I'd be seeing a private specialist but it wasn't needed, the NHS had done a fine enough job despite it requiring a second appointment, pretty much summing up the hit and miss nature of a successful diagnosis beyond "rest and it'll heal itself". How naive I was to think that it was now going to be problem free by going with the NHS; I then went to arrange physio. The physio request was faxed to a hospital more local to me, upon which I was told the new hospital was contact me soon to arrange my appointments and there was nothing else for me to do. I waited a few days. A week later, I was surprised to have not heard anything but knowing that the request went out on the Friday of the previous week I decided the weekend would have affected both the work there and the mail. Two weeks after the request, remembering that the physio itself was only supposed to last four weeks, I decided to call the new hospital. In my excitement at the time I'd not even taken the details of which hospital it was so got in touch with the original physio department that faxed my request over, reconfirmed that they had sent it over, and they resent the request just in case. I got in touch with the new hospital, they'd received it at the time and the second request sent that day but told me that "we were arranging prioritisation and as your request was non-urgent it was put on the waiting list". The waiting list turns out to be NINE weeks long, over twice the length of time I'm supposed to have been taking physio and healing up anyway, but the worst part of all is that they weren't going to tell me this and instead were going to get in contact with me at the end of the waiting list period to THEN arrange when my first appointment was. I understand that the service is for many people in worse situations than me, but that doesn't excuse poor quality of care. That I wasn't informed of this wait and had been informed by the referring physio department to expect a letter in the "next few days" instead of "in about 9 or 10 weeks" is a huge problem, because I'd at least like the option to heal up sooner and without complications of healing without suitable physio that may cause further problems. A simple bit of contact that there was going to be a delay would mean I'd at least know what's going on. The NHS is huge so I imagine this sort of miscommunication happens very often, and the only was to get quality care is to chase things up yourself. In future if anything happens I'll be doing precisely that, getting estimates of times that I should be hearing from people or getting new appointments, and unfortunately I'll also be researching whatever problem it is online to see the range of problems and the sort of diagnostic methods that should be taking place. The problem with researching problems yourself is that the internet is full of either useful information listing symptoms of given problems, which is terrible as many different problems have similar symptoms and it's easy to convince yourself you have a completely different problem (which is why doctors are required to learn a wide a range as possible of potential situations that could cause said symptoms) or one much worse than you think, or it's full of people complaining on forums and blogs (yes, like this one!) about a problem that should have been diagnosed and was much worse than the doctor said, so look out for . I'm not going to talk about my knee in particular and say that it a doctor says it is one thing then get him to check the patellar tracking or anything but make sure it's as verifiable as possible. If a diagnosis is from imaging, get him to explain the image to you and why (s)he thinks it's that problem- bones breaks are great because there isn't really any doubt that the gap between those two bits of bone shouldn't be there, small lumps or fractures are less obvious so get him to explain; but also get that second appointment to see if the radiologist agreed if he says that nothing is wrong. I hope for no more injuries or sickness, but I foresee private healthcare something to consider much sooner than I used to. Well, it's certainly not been the best 12 months for having an uninjured body! My wrist recovered well from the surgery after a couple of months and is pretty much fine now, with a feeling of dullness in the wrist sometimes and slight cracking and ache when rotating the wrist around, along with the permanent scars which actually consist of just three small dots (arthroscopic surgery is brilliant these days). Unfortunately, it turns out there is something else wrong with this body of mine. A few times in the past my kneecap has given way as a result of some, not excessive, twisting motion of my leg which causes great pain but usually felt okay after a couple of weeks recovery time, and never impacted my life as my life was almost entirely sedentary. These days I've actually been taking a focus on fitness and strength training so overall the strength around my knees has increased greatly but it still didn't protect my kneecap from giving way after a nasty twist, which happened as a result of landing short from a running jump to step-through, causing my foot to twist inwards at an extreme angle, the result of which was a feeling of multiple parts of my knee feeling like they were giving up and running away from my body, tearing through the tissue that might be in the way. Much pain, but I was surrounded by many of my friends (a subset of our "Sunday Trainings Supa XXL" group, who are a perfect example of the overwhelming sense of friendly community in the world of parkour) so I was in very capable hands, so when the ambulance arrived I was there with a makeshift ice pack comprised of many ice-pops wrapped around my leg, tied with a piece of clothing that belonged to someone (not even sure who!) surrounded by many people trying to help and sharing their knowledge of the body and tales of past injuries. The short story of what happened was a patellar dislocation. The long story is a patellar dislocation due to my knee having a predisposition to do precisely that which could be fully fixed only with surgery which will happen if it reoccurs. This brings my "injury requiring an MRI" count up to two in my lifetime, both times in the past 12 months, both due to a preexisting condition that causes an injury to be much worse and longer lasting than would have otherwise been the case. The full medical description of current problems: "transient patellar dislocation with an injury to the medial patellofemoral ligament and bony oedema on the medial facet of the patella and non-weightbearing lateral femoral condyle"
I'll be starting physio soon, much later than planned due to a lack of expected communication from the NHS physio department that I was referred to about a 9 week waiting time..., but it'll still be a few weeks before I can do any form of impact at all, so my usual leg training with plyometric jumps and precisions won't be happening anytime soon. I was off of crutches within a week but I've still got a slight limp now four weeks on, and holding balance in any squat position at all (various angles tried) soon causes pain in a few spots on my knee, and normal, very mild angle, twists when muscles are tense still causes pain and discomfort. Bad times. I'lll always be worrying about the chance of the dislocation reoccuring so may have to seriously reconsider my future in parkour. Until then, upper body conditioning! Having had a couple of months with a recovered wrist I've been free to make some upper body progress and will try and continue this trend during my recovery, and beyond. I've still got plenty of muscle-up progress to make which is the main focus of a session or two each week these days. Wrist update: still no good. Surgery was fine but many weeks before I can put much weight on it. Current status - My wrist is still injured, from the low fall on halloween :( I've got surgery on my wrist in May, maybe I'll give more detail another day but not right now mainly due to having an exam in the morning! The main point is that it hurts and could still be months to heal. My main aim lately is to train running precisions, especially as I'm injured so still can't work on pretty much anything with my upper body. After vastly improving my power and standing precision jump over the past year, I still seem to have a large amount of fear doing running jumps of distances even slightly above distances I can do standing, so this is an area I've started training and will be more focused on training hard soon. Recently I've managed to break two running precisions that made me very happy, one I found and managed to do later that same day, another jump near my house that I'd done once in a flurry of confidence but had since been afraid to do for months. After becoming confident in my ability to successfully make the jump comfortably, drilling that large jump multiple times earlier in the week felt good, a good sign of progress, which has been something I've lacked lately, especially managing to stick the landing after training it some more. This is definitely a jump I'll be returning to many times in the future. After testing my camera earlier in the day I decided to make the most of the dry weather and head out for a bit of training, gathering a few clips along the way. 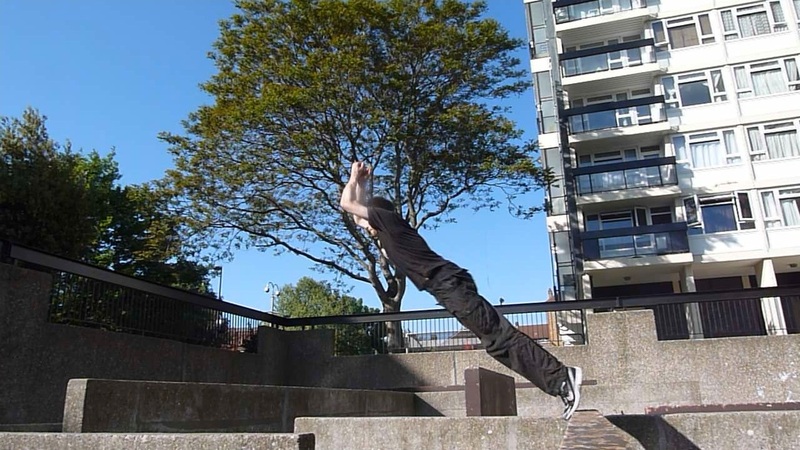 As of yesterday it's now been a year that I've been doing parkour! I had a good training session last night mainly repeating movements from previous sessions during the week to reinforce the confidence to do them and increase my comfort of each technique through repetition. Now moving in to year two which I hope will be just as much fun and productive in my progression! A bit late in the month already but I figure it's time to list my goals for the coming year in my training, Though not strictly new years resolutions as all because of a continual aim to be training, setting targets for the year still feels a fine thing to do and formalising certain tasks seems something definitely worth doing to perhaps remind myself if I feel unmotivated later in the way. This will be a reasonable tough goal, starting the year at around a maximum of around 35, but with the right training attitude it should be no problem at all. I'm under no illusions, I know this is a huge undertaking coming from a level of being barely able to perform one muscle up but with breaks between sets of one or two I can see this as a possibility in a session below two hours and am aiming for a lower time if possible. Many of the targets I have, in particular improving my distance and confidence in my cat passes, have to be delayed to allow my wrist to fully heal. The past couple of weeks it's been completely pain free but with noticeable niggles here and there, so I'll not try anything which could anger it until I've noticed nothing wrong for a few more months.